The Diana Lee Fox ’75 Resident Artist program was started in 1981 to honor Diana's memory. Through the Fox family's generous support, Park is able to bring an accomplished artist to campus each year to work with Upper School students and present a gallery show. The winter exhibition, Worldly Possessions, is now on view and features the work of this year’s resident, artist Jean Shin. Yesterday, Park welcomed Shin to campus to present her work to Upper School students in assembly. She also held two workshops in the afternoon, where students had the opportunity to view her work up close and create installations of their own using Shin's 35mm slides. Shin’s work has been widely exhibited in over 150 major museums and cultural institutions, including solo exhibitions at The Museum of Modern Art in New York, Fabric Workshop and Museum in Philadelphia, and Smithsonian American Art Museum in Washington, D.C. Her works have been on view at the New Museum, Museum of Fine Arts Houston, Museum of Fine Art Boston, and the Barnes Foundation, among other prestigious museums. On view until March 1, 2019, the gallery show Worldly Possessions features photographer Tom Kiefer’s series El Sueño Americano (The American Dream), and artist Jean Shin’s installation Projections. Park School’s winter exhibition considers the impact of America’s consumer culture on our humanity. Work created in the Upper School Feminist History course is presented in the Library Gallery. Works by Middle and Lower school students are also on view. Click here for more information about our Resident Artist program. 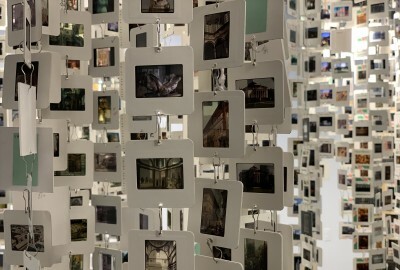 Image: Shin's installation in the Richman Gallery is made up of thousands of 35mm slides that depict the history of art from ancient to modern times.